We’ve canoed the waters of Texas; climbed the highest peak in the state; attended National Jamboree; Philmont, Sea Base and Northern Tier; and visited summer camps in Texas and Colorado. Our scouts have learned to shoot .22 rifles, sail a boat, water ski, rock climb and cook a darn good cobbler. We strongly believe in Scouting as a resource for young men to learn leadership and independence, and for adult leaders to collaborate to help our boys become tomorrow’s leaders in business, our community, and in faith organizations. 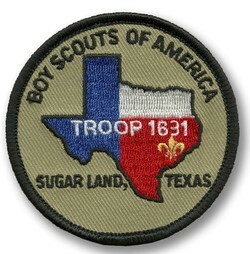 We are proud of the more than 150 Eagle Scouts who call Troop 1631 home. The Troop is non-denominational and is highly diverse. We are sponsored by the Optimist Club of Sugar Land. We meet Monday nights at 7PM at Fort Settlement Middle School. 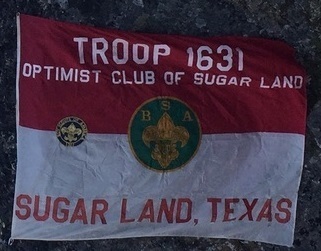 The troop has a camp out every month during the school year, and host one high adventure (Philmont, Sea Base, Northern Tier) adventure each summer, along with summer camp and winter camp.